The following liner notes were taken from the 45RPM box set shown (released in 1949). This is the remarkable story of a remarkable little organization. Believe it or not, the silky-smooth, honey-sweet singing style of the Ink Spots was once as hot and jive-packed as a jitterbug. But that was before they discovered that their forte was the mellow kind of ballad featured in this second collection of favorite (original) Ink Spot interpretations. "We struggled along for five years featuring jive arrangements," they point out, "but nothing happened. At that time we were on the verge of disbanding because we couldn’t get work. As a matter of fact, we were working - at the New York Paramount Theatre - not out in front as singers, but backstage as porters, and the only singing we did was between pushes with brooms and mops. It was a good thing we did keep practicing as a group , however, because an artist-representative happened to hear us one night. We were signed to contracts and next thing we knew we had recorded 'If I Didn’t Care' for Decca. It turned out to be a best seller and we immediately countered with another slow, sweet tune - 'It’s Funny To Everyone But Me' - which, combined with the total on our first record, established a new high in Decca sales. That double convinced us and since then - 1939, incidentally - we have continued to try to give the public what it seems to prefer, at least as far as our style is concerned." And that, briefly, is the success story of the Ink Spots - who got their name, by the way, not because their complexions happen to be dusky. Legend has it this way. The four young men and their manager were sitting in an office trying to think up a likely name for their quartette. They had rejected such common place monikers as 'Harmony Four', 'Rhythm Quartet', 'Jazz Melodeers', and a score of others, when their manager idly glanced at the blotter on which he was doodling with his pen. The pen seemed to have gone dry and he shook it impatiently. Four blots appeared. 'The Ink Spots!' he shouted, and The Ink Spots they were and still are. Two good reasons why the Ink Spots’ song-treatments are so outstanding are the vocal innovations introduced by the late Orville 'Hoppy' Jones, and Bill Kenny. Jones, bass singer and cello player with the Quartette until his death in November of 1944, gave the Ink Spots their now-famous 'talking choruses' which are so closely identified with the group. Hoppy’s tender basso-profundo ad libbing, behind a super-slow background of humming and strumming by the rest of the boys, on 'If I Didn’t Care' (included in a previous record) helped to create one of the most original and appealing of ballad treatments. In contrast to Hoppy’s deep voice is the crystal-clear tenor of Bill Kenny whose sweet choruses are so high, so remarkably pitched and so soprano smooth, that audiences still gasp: "Is it real?" 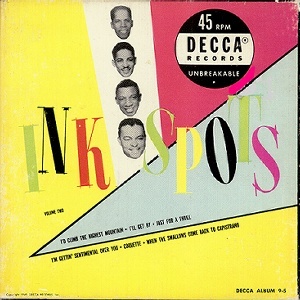 At the time these recordings were pressed, the other two Ink Spots were Charlie Fuqua, baritone and guitarist of the foursome; and Ivory 'Deek' Watson, tenor and composer of the unit, whose songs 'Pork Chops and Gravy', 'Your Feet’s Too Big', and several others the Spots have recorded and built into hits. At present, the Ink Spots are Bill Kenny, Charlie Fuqua, Billy Bowen, who replaced 'Deek' Watson; and Herb Kenny, Bill’s brother, who now carries on for 'Hoppy' Jones.